Trellises provide support for climbing shrubs like roses and soften large expanses of brick or masonry. Use properly secured trellises to support grapes or kiwis for a fruitful garden accent. Support espaliered shrubs or fruit trees with sturdy trellises to easily train them. Place trellising behind large planters to provide support for quick growing annuals like sweet peas or morning glories. The easiest trellises to build are trellises made from galvanized garden wire and eyebolts. Secured properly to a brick wall, they're sturdy, long-lasting supports for a wide variety of garden favorites. Decide on your design shape and size and graph it out. The most common form is a diagonal lattice, but squares, vertical rectangles and any graphable geometric design can be created with enough wire, turnbuckles and patience. Measure down from the top of the wall to your desired top height and mark your first eyebolt hole for the upper row. Measuring from the ground may not give you a level start. Measure across 12 inches and mark the next eyebolt hole for the upper row. Mark three more eyebolt holes 12 inches apart for the top row; there should be a total of five. Use a level to check your pattern before completing your design if you think the brickwork may not be even. Expand the design to make a larger trellis by increasing the space between all eyebolts to two feet. Mark out the bottom row of eyebolt holes by measuring straight down from each upper eyebolt hole and making a mark at four feet. Measure eight feet for the larger trellis. Mark out the outer diagonals. The easiest way to do this is to draw a 12-inch square on a piece of sturdy cardboard. 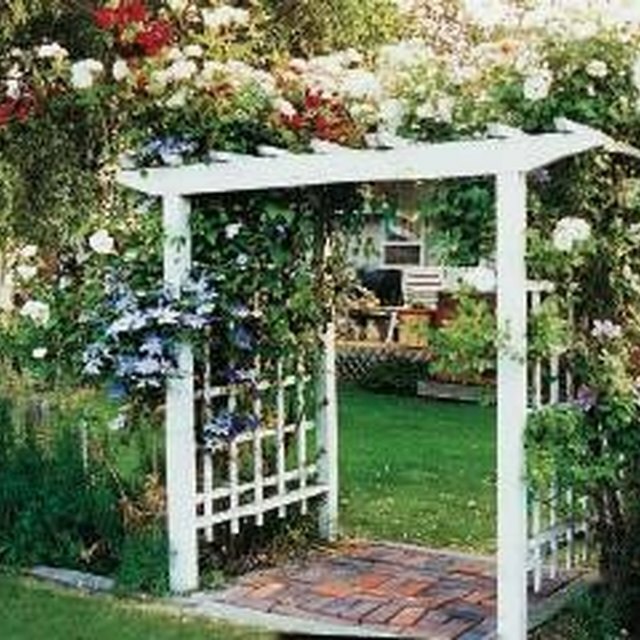 For the large trellis, increase the square to 24 inches a side. Hold the square like a diamond with the top of the diamond against the top left eyebolt hole. Mark the first diagonal eyebolt hole where the left tip of the diamond touches the wall. Measure down one foot (two feet for the larger trellis) and mark the next hole; repeat twice for four diagonal supports. Repeat steps on the right side of the pattern. Using a masonry bit sized for your anchors, drill holes and set your shields by tapping with a hammer. Screw eyebolts into masonry anchors leaving four inches showing. Chalk numbers by each eyebolt, top row first, for your stringing diagram. Top left eyebolt is 1, top row is: 1, 2, 3, 4, 5. Bottom row is: 6, 7, 8, 9, 10. Top left-hand diagonal eyebolt is 11, left-hand eyebolts top to bottom are: 11, 12, 13, 14. Right-hand diagonal eyebolts are 15, 16, 17, and 18. Secure the wire to the top left-hand diagonal eyebolt and feed it through the other eyebolts to make a pattern of diagonal squares. You should end at the same eyebolt. Pattern is as follows: 11, 9, 17, 3, 13, 7, 15, 5, 6, 14, 4, 16, 8, 12, 2, 18, 10, 1, and 11. Use a turnbuckle to tension the trellis. Attach the two wire ends to the eyes in the turnbuckle. Secure wire by taking several turns around the turnbuckle hole. Tie remaining wire around itself in a two half hitch knot. Turn the turnbuckle clockwise to tighten the trellis wire. Continue till the wiring is taut. Wire trellises will not support great weights and are best for light climbers. Do not use regular nails to fasten trellis wires to brickwork. Rusting steel expands and rusty nail-work can ruin mortar. Use only hardware designed for masonry.